You may think that having an inventory of “salvation verses” memorized such as those that comprise the famous “Romans Road,” along with a gutsy attitude, to be your main tactic in spreading the Gospel to the unreached. 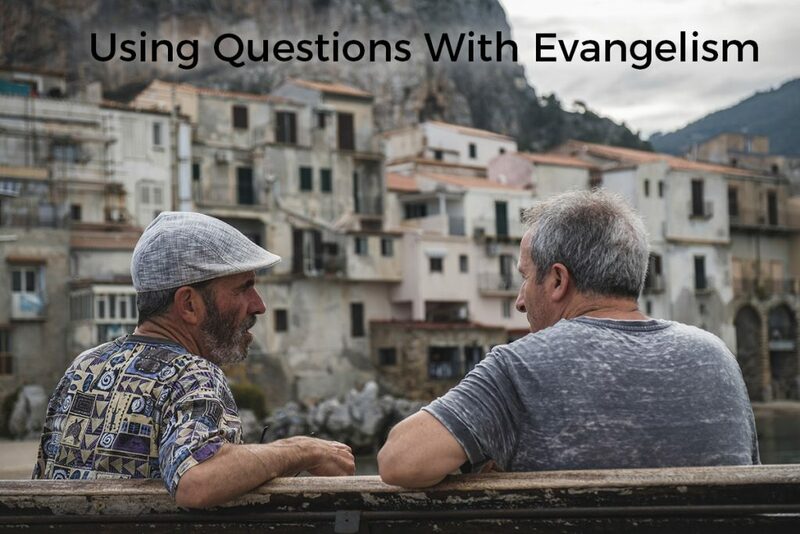 That is excellent, but I also think that asking questions during evangelism is one of the most powerful and effective approaches you can take. If you’ve studied your way through all four of the Gospels more than once, you’ll know that Jesus encountered a vast assortment of characters during His earthly ministry. What you might not have realized was, Jesus often used a mix of probing and rhetorical questions in his conversations with these people. Being the Son of God, it’s obvious that He already knew the answers to everything He asked. Our Lord did this for the benefit of the people He directed those queries towards. It was a genius strategy that produced amazing results; for the person in question, it brought out previously hidden truths, it forced a deeper and more honest understanding of where the person was in their spiritual journey, and it often knocked down walls of rationalization and sin that they put up as a defense. While we are not omniscient, we can still employ a similar approach to conversing with people about the Gospel. An approach of posing questions in our evangelism efforts can have two-fold success. The point is, folks you meet frequently have a poorly thought-out patchwork of ideas that often don’t hold up to their own scrutiny if they really think about it. Guiding them through questions can aid in them breaking their current beliefs down, clearing obstacles that might be in the way of the more logical approach of Christianity. The second way that the question-asking approach works is, this tactic veritably helps you get to connect with folks on a more personal level. You will get to know them better and see what makes them “tick” – whether or not they had previously been a total stranger to you. And since they will force themselves to see why they believe the way they do, they will simultaneously get to know themselves better in the process! If you sprinkle in your own responses that you find in common with them (“you’ve come across hypocrites in the church, too? I know exactly how you feel! Here’s what happened to me…”), you can actually start to build a relationship with them. And relationships can start to tear down those defensive walls people erect, making them more open to what you have to say about the Gospel. From here, you could get a bit more specific based on what your new friend brings up in the conversation, always putting them in the place where they’re forced to introspectively example themselves. You should also practice this interrogative style of discussion. Have a spouse or a Christian buddy play a “sparring partner” to get used to engaging in asking questions in evangelism by role-playing: one of you can play the believer in Christ, and the other a non-Christian. Flip-flop back and forth in the role-playing and come up with various scenarios that you might encounter in the real world: moral dilemmas, science, history, substance abuse and addiction, sexual ethics, topical issues, etc. I want to thank Jeremy Smith of Faith Ascent Ministries for introducing this concept to me. Definitely check out Faith Ascent as they do some awesome work that specializes on providing good, grounded apologetics to teenagers. Spot on Scott – questions are the best way to get people to genuinely think. Tell somebody something and they often start to judge, to argue or worse deny – questions though invite thinking and engagement. I think this is such an important concept! Too often we beat unbelievers over the head with a “repent of burn in hell” message and it does nothing but turn them off. Great thoughts here Scott! Though I’m a Christian speaker and blogger, I think my best responses have come through the unscripted moments, because THEN I’m relying entirely on the Holy Spirit, who knows this other person intimately. Of course, I relied on the Holy Spirit when writing and planning my presentation, BUT with an open ended question you’re flying by the seat of your pants, and for the well-prepared, even we KNOW you’d better pray for guidance pronto. Those unplanned responses have borne fruit, and it’s been all the Lord, whether in a prison, on the street, or at church. Christianity Today had an article recently where the author said: Always ask about the tattoo. It’s personal. It’s there for a reason. There’s ALWAYS a story behind it. Listen! Great post, Scott! Thoughtful and applicable! Such true words. Questions help keeper the hearer engaged while showing us where they are in their understanding of the gospel. I think it also needs to be a natural conversation, not us trying to convince someone of something. Conversation back and forth with questions. Thanks for your ideas on the subject. I always think of the saying “ we are all called to share the gospel and sometimes we might have to use words.” Our lives should reflect our walk and that can open doors to conversations. You make such a valid and good point, you made me evaluate how I approach the gospel in conversations and missions. Thank you! I love this concept of asking questions. It gives people a chance to talk about themselves–which most people enjoy doing. And it gives them the chance to think through their own thinking. It’s the way to go. Great post. God bless the efforts to enlarge the kingdom! Thank you so much for this wonderful write up on using questions. I have often pondered how much God uses questions in scripture – when He already knew the answer. But the question, in this case, is not so much for the benefit of the one asking as for the benefit of the one being asked.